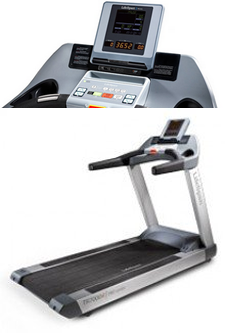 The TR2000e electric folding treadmill leads you all the way from "I wish" to "I did", with zero compromise. A simple-to-navigate console gets you moving instantly, while 21 built-in programs do the rest. Perfect for running or walking, the 20" by 56" running surface features 8 impact-absorbing compression shocks to guarantee a consistently comfortable workout. A capable, 2.5 hp continuous-duty DC motor, reliable hardware, and exclusive fitness tracking capabilities keep you moving forward. 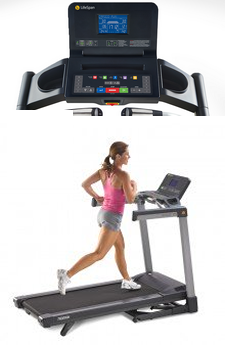 And when you’re done, eFold™ technology electrically folds the treadmill to a space-saving design. Never choose between powerful workouts and simple, convenient storage. 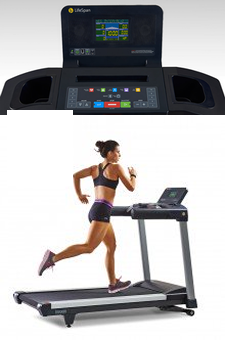 The TR3000e treadmill powers through your most demanding training sessions, driven by a premium 2.75 hp motor and premium running deck, then automatically folds for convenient storing with e-Fold™ technology when your workout is completed. The 3-speed cooling fan, dynamic exercise programs, automatic step counting, and impact-absorbing compression shocks create one of the most powerful exercise experiences available. An available Bluetooth-receiver adds additional convenience, facilitating wireless transmission of all workout data. NEW 2016 Model! The TR3000i is the perfect complement of efficient, space-saving technology and heart-pounding hardware. Quick, EZfold™ assisted folding makes both storage and unfolding a snap, getting you moving towards your goals safer and with less time. A stable, full-steel frame rests beneath the 20” x 56” running deck, perfect for walking, jogging, or limit-shattering sprints. An available Bluetooth adapter syncs your exercise data directly to your smartphone, putting you in better control than ever. NEW 2016 Model! Designed to take your training as seriously as you do, the TR4000i folding treadmill is equipped with performance-tuned hardware and intelligent, fitness-tracking technology. A 3.25 hp motor and dependable all-steel frame provide perfect running conditions for any workout, mile after mile. The spacious, 20” x 60” running surface is supported by 8 compression shocks, keeping you striding in comfort. 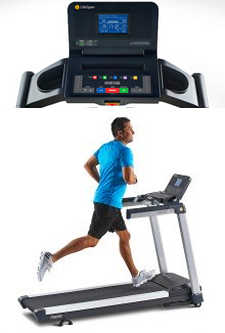 Performance meets convenience, as the treadmill folds to a minimal size for unobtrusive storage when you’re done. NEW 2016 Model! 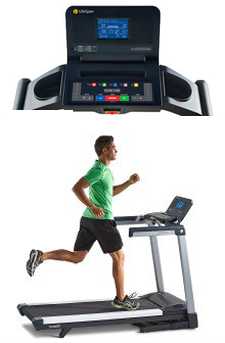 Engineered for superior cardiovascular performance, the TR5000i treadmill goes the distance, before going further. The precise integration of a powerful, 3 hp continuous-duty AC motor, all-steel, non-folding frame, and spacious, premium running surface let you run as long and as hard as your workouts require. Designed to shatter both expectations and personal records, the TR5000i’s intuitive displays, personalized programming, and optional Bluetooth keep your fingers directly on the pulse of your fitness. New LifeSpan Model! Built to last, the LifeSpan TR6000i light-commercial treadmill will support you through your toughest workouts in the most demanding commercial settings. Armed with incline and decline capabilities, gym-quality componentry, and sprint-length dimensions, the TR6000i guarantees no training goal goes unfulfilled. Built-in speakers and integrated tablet holder provide entertainment at no annual cost, keeping you focused on the miles ahead. 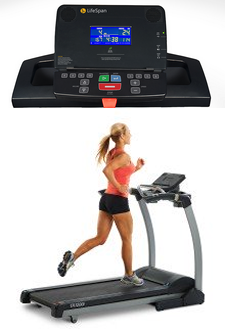 Second to none, the TR7000i commercial treadmill has redefined performance-grade quality. 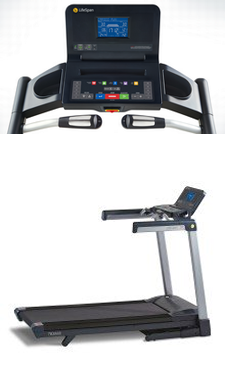 Elite in every category, these commercial grade treadmills pack a 3.5 hp AC motor, durable steel construction, and every premium feature your training program demands. The 22" by 62" running deck permits full, athletic strides, while four impact-absorbing shocks replicate real-world environments that are gentle on your knees, back, and joints. With Bluetooth technology built directly into the console, your training information is synced seamlessly at the push of a button. 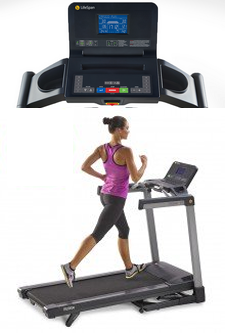 Run with confidence, the TR7000i comes with our full commercial warranty and is the perfect high-end treadmill for any home or gym setting. The TR8000i medical treadmill pairs robust construction with specific medical fitness capabilities to form the best health and rehabilitation treadmill available. An impressive 5 HP, permanent-magnet AC motor combines with a spacious 22” x 62” running surface and heavy-duty frame to ensure stability and long-term dependability. Features include exclusive LifeSpan technology, as well as industry leading, medically-appropriate proficiencies. Reverse belt motion, 3% decline, and full-length medical handrails guarantee perfect functionality in medical or rehabilitative settings. Arizona Extreme Fitness will deliver and setup your favorite quality Life Span Fitness treadmill in Prescott, Flagstaff, Sedona and Phoenix, Arizona at your location! Come on in and browse our 3000 sq ft warehouse showroom in Prescott Valley, Arizona and try before you buy or if you already know what you want just call us for our best price and we will deliver or ship it to you depending on your location in the USA. 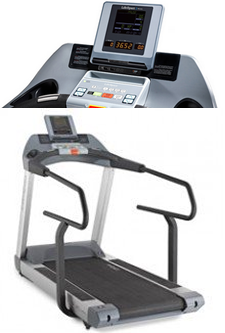 We sell, deliver, setup, install and service the above quality brand Life Span Fitness treadmills.